My sister, her husband, and three of her four children (one a six month old) arrived late Monday night from Louisville, KY. They drove 11 hours to spend one day with us and watch Alex. All I can say is WOW! 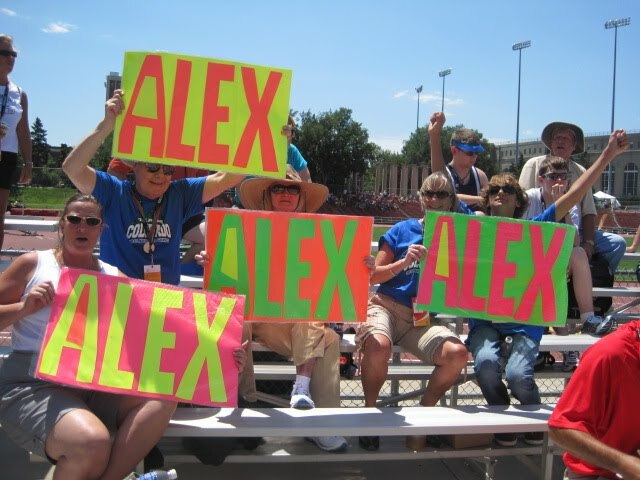 Alex is lucky to have such a loyal family. We have figured out our daily routine and having a great time. Lincoln is a nice town, a big city with a little city feel. The citizens have opened their hearts for this six day event. Lincolnites (I made up this word) are friendly, enthusiastic and proud to be our hosts. We are greeted with smiles and hellos wherever we go. We learned there was a competition between Rochester, NY and Lincoln to host these Games. The decision was made three years ago and Lincoln had time to prepare. The volunteer system, games management and family events have all come-off without a hitch. Everything seems to be well rehearsed and fluid. A huge success and testament to the power of well executed planning. The events are being held at the University of Nebraska facilities; it is a huge school, although anything outside of Carbondale. CO is huge to us. I learned that “Go Big Red” seems to be the appropriate greeting when meeting anyone from Nebraska. We are in the heart of Cornhuskers Country where football is as important as all the corn fields that stretch for hundreds of miles across the State. As Coloradoans (I did not make up this word) we are accosted often and asked for pins. Pin trading is a popular sport at the Olympics. All the athletes were given 15 pins to trade with the other athletes. Alex’s were gone within minutes; she proudly wears the pins from the other states on her credentials lanyard. Apparently, the CO pins are very popular and since we are easily recognizable by the Team Colorado tee shirts I bought for everyone in my family and insisted they wear, we disappoint the athletes each time. We spent the day watching as many events as we could. There are a total of thirteen sports, and although most of the events are in facilities close to each other a few are not. We stayed near the track and were able to watch gymnastics, power lifting and a number of track and field events. These athletes are talented and try as hard or harder than any other athletes I know. Alex competed today in the 4x100 relay with her teammates; Charlie, Ben and Aimee. The team beat their best time by six seconds. Alex also had her 100 M race today and beat her best time by a few seconds. Christine left tonight and the rest of our group (Mom and her husband Tom, Molly and Jeff and my sister and her family) will leave in the morning. These first days have gone by so quickly and every moment has been filled. We are ready for our next group; my two sisters from New Jersey. Alex has been so appreciative and happy to see all her supporters; there is nothing that beats a 17 year old with down syndrome in the hug department. She can make all your travel misery and 11 hours drive worth it with her thanks and hugs. I wish I had that power over people! As a Lincolnite, I assure you, that word is real. Sort of. As real as these things get I suppose. 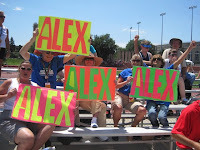 So glad Alex and your family are having a fantastic time! You're making me homesick for NE! Cornhusker country is a great place to be! If you need a place to eat--go check out Lazlo's...and make sure you order a basket of fries and some creamy garlic dressing to dip them in for me! Go Big Red! !